An iSUP can easily make up for a lot of fun that you might have missed. These inflatable stand up paddle boards are simply a great invention for a great quality time with friends and family anywhere with water in it. A lot of ambitious people managed to build great companies that target the iSUP industry, making it a very serious and dedicated market that puts a lot effort and thoughts into making the best inflatable boards that can stand head to head with hard boards. In this review, we’re going to introduce the RoC inflatable stand up paddle board that’s a fully equipped iSUP with some really nice dimensions and features. The ROC is praised for its great width that not all companies offer; it is 33 inches wide and that is more than enough for a large adult to be extremely comfortable and adjusted on it. Also, it’s 10’5″ feet long which I always find very convenient for almost all rides with different sizes. As for thickness, the ROC kept the good work and made this board 6 inches thick which I’m sure you already know it’s the best number any company can produce for this type of iSUPs. These dimensions are carefully and properly chosen to make sure the board is both; big enough in a professional way to suit all different paddlers’ levels, and not hard to handle when fully inflated. Pretty much anyone including beginners can handle this board starting with inflating it, using it or transporting it and of course packing it. 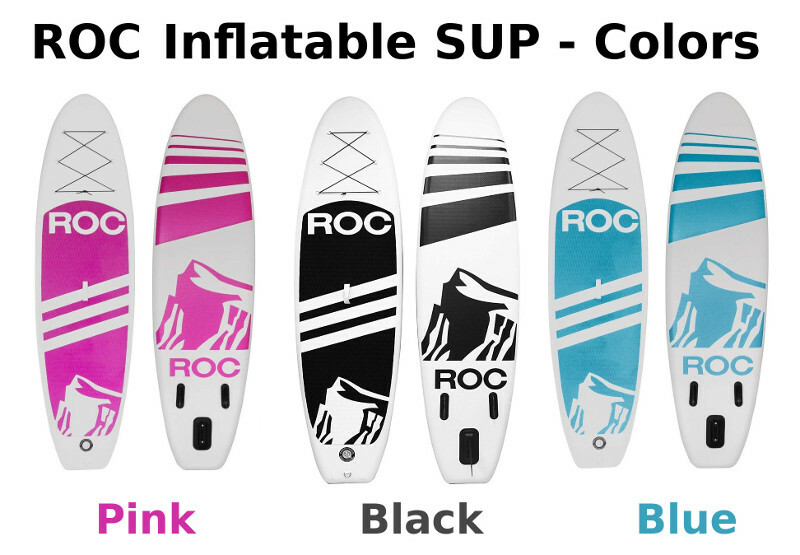 P.S : The Roc iSUP comes in Three colors : Blue, Black, Pink. You can tell a good iSUP from a lousy one easily by how they look. The material used to build any iSUP MUST be of best quality to make sure it’s firm and durable. The better the material, the stronger the outer shell will be, and thus; the iSUP will simulate an authentic one both in looks and performance. The ROC here is made of military grade PVC material that’s universally known for being tough and virtually indestructible when it comes to inflatable products. The ROC is a solid iSUP with great potential to do pretty much anything thanks to drop stitch technology that’s used to seal its parts together in a way that they would never come off. Another innovational thing about iSUPs in general is that even though they’re tough and rigid, they’re still light and travel friendly. This iSUP can carry up to 350 lbs with no struggle at all where it would cruise steadily with a great deal of balance especially in flat water. Such a board is highly recommended for anyone who’s interested in comfort and stability with a large weight capacity. 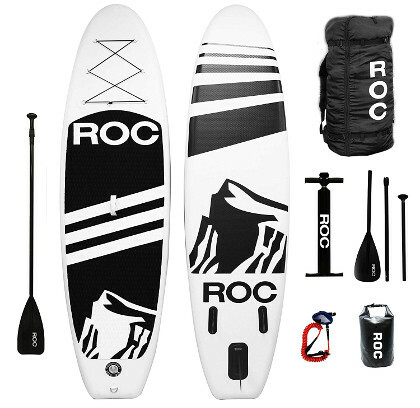 The overall shape of the ROC clearly indicates that it’s an all-round iSUP which is great for touring, recreational paddling, Yoga, as it even can take some waves for fun. The round nose of this board makes it easy to cruise in different water conditions; however, flat water will definitely bring out its best performance. Next, there is the thick and rough diamond grooved EVA traction pad that’s meant to add to the board’s thickness and stiffness as it also work as a soft padded area for your feet/knees/body to be protected against skidding and also comfortable. This pad covers almost two thirds of the board’s back which is enough for an adult to lie down on it. Then we have the bungee system that consists of 6 stainless steel D-rings that are connected with a bungee cord on the board’s deck. These are great for anyone who likes to paddle along with everything they need secured to the board with them. Also, there’s a seventh D-ring on the board’s tail to attach a safety leash. At the center of the board, you’ll find rigid carry handle that’ll make it easier for you to transport the fully inflated board. With this one handle you can balance the iSUP using one hand and walk around easily. Now something that adds to the board’s performance if the navigation system. The ROC here is featured with three fins that are nicely made to work better stability and navigation performance in an attempt to make this iSUP as versatile as possible. The central fin is large and removable while the other two are lateral and smaller. These are all the main features you’ll find on the ROC iSUP and they are considered to be the standard for all quality iSUPs with no exception. This board lacks nothing for it to be a great travel companion that’ll make water time a better time. It’s technically everything you need to deal with an iSUP. 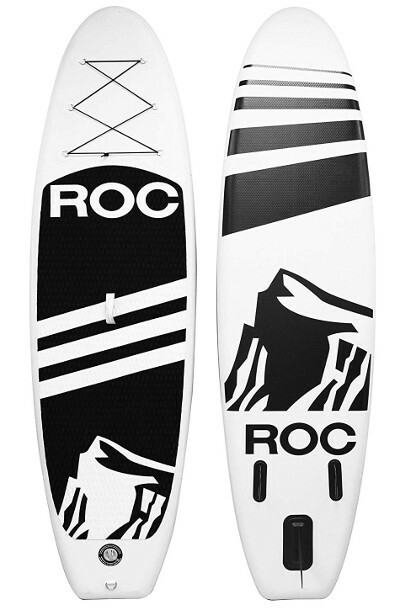 The ROC is a nice iSUP that’s really stable in flat water. With the right navigation skills; this board is as steady as ever. Even if you are a beginner who’s interested in this friendly water sport, the ROC would still make a great choice because the fact that it’s 33 inches wide is a plus when it comes to picking up standup paddle boarding. As previously mentioned, the ROC is pretty versatile and it can be used in different water conditions. Still, we believe that it gave its best performance in flat water where tracking was a lot easier with less water resistance. Concerning users who are into white waters or rivers; the ROC can totally take the challenge thanks to its shape, navigation system and thickness. You can definitely perform some maneuvers while being in complete control over the board. There was nothing really that bugged me while reviewing this board. Every was neat and it performed very nicely in flat water.